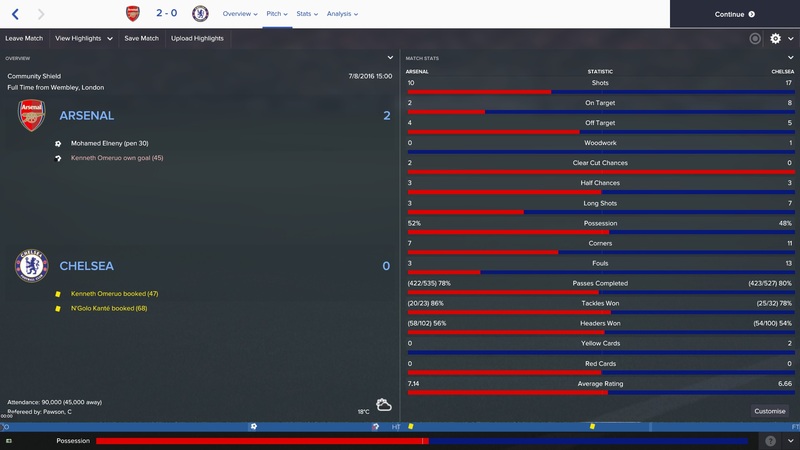 Can Football Manager accurately predict the outcome of real life matches? In this brand new series on VivaLaVidaFM, I will be putting both FM17 and FM18 to the test as we look to see how accurate the game is. Over the course of the upcoming 2017/2018 English Premier League season, we will be running weekly simulations of the game to see if it can predict the results of each EPL game-week. To make matters more interesting, I will be placing a small bet for each EPL match based on the FM prediction. The plan is to place a bet on a specific event to happen in real-life that occurs in the FM version of events. It can be on any market I choose but it must have happened in-game. For example, should Diego Costa score the first goal in the Community Shield on FM then I could place a bet on that to happen in real life. But I may choose instead to select a different event as I might not think that Costa will play in the match. Over the course of the 2017/2018 season we shall see how accurate Football Manager is at predicting real life results. Regular FM’ers will know that the most seasons have their fixtures generated when loading a new save, meaning that their in-game fixtures do not correspond with those in real-life. I, however, will be following the real-life fixtures by using a database which I will update each week. I will also use the in-game editor to remove any injuries that FM creates and to add the real-life injuries that FM does not. This should allow for the FM managers to pick from the exact same squad that their real-life counterparts can. I am aware that for each FM save you play, the results can vary significantly. For example, I could have Everton versus Liverpool simulated to finish 3-0 to Liverpool, only to re-simulate the match for it to end the complete opposite. Therefore I will simulate each game-week once and take the first set of results as they come. After running many simulations I have found several things that I cannot control when comparing real life to FM. Arsenal set up with a standard 4-2-3-1 system whilst Chelsea chose a variant of their 5-3-2WB system that won them the league last season. A new look back 3 for Chelsea being the main talking point in the lead up to kick-off. A 2-0 win for Arsenal saw them lift the 2017 Community Shield. Mohammed Elneny scored the opener from the penalty spot before a Kenneth Omeruo own goal sealed the victory. Arsenal won the 2017 Community Shield on penalties, drawing 1-1 in normal time before winning 4-1 on penalties. Unlike on FM, Arsenal played with a 3-4-3 formation to match their counterparts Chelsea. It was Chelsea who took the lead shortly after half-time through Victor Moses. In the 80th minute Pedro was sent off for a reckless challenge and the resulting free-kick lead to an equaliser by new signing Sead Kolasinac. Arsenal went on to win the penalty shoot-out 4-1 in the new ABBA format. As mentioned earlier I will be making bets based on the events that occur in each FM match. This section will be used to keep a record of both my betting choices and the successfulness of Football Manager predicting real-life football. Unfortunately, due to being on holiday in Spain at the time of writing this post I was unable to place any bets due to the restrictions of betting in the UK. This section will begin once the EPL season starts and I am back in England able to bet. Let me know your thoughts on this first post. Is there anything you would change? What would you like to see done differently? How much money am I going to lose this season? This entry was posted in FM Predicts, Football Manager 2017 and tagged arsenal, arsenal v chelsea, chelsea, community shield 2017, FM Predicts, fm17, football manager. Bookmark the permalink. – Could you forcibly take control of teams to force a certain squad registration? -And you could raise the CA/stats for players performing well in real life. I looked into the morale but couldn’t find a way of lowering it on the editor. If you use the in-game editor and start editing on a profile you can edit morale level.